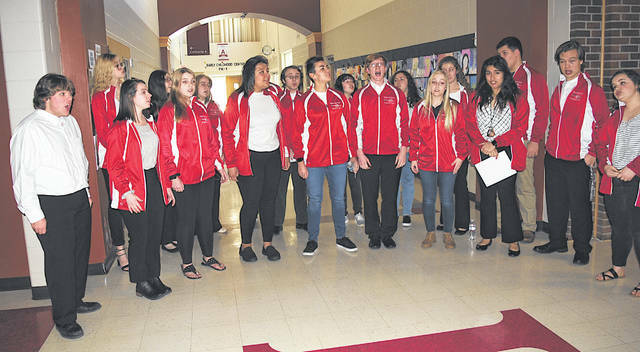 Students sing in support of Choral Director David White prior to Monday night’s Hillsboro Board of Education meeting. After a one hour and 56 minute executive session, the Hillsboro City Schools Board of Education voted 3-2 Monday night to approve a recommendation from Superintendent Tim Davis to consider the termination of Choral Director David White’s contract. According to Davis, White put students in danger during a recent trip to New York City when he allowed 12 kids on the trip to move a car that was blocking the path of their bus. During the public participation portion of the meeting several students and community members spoke in favor of White until the board said the allotted 30 minutes for them to speak had passed. No one spoke against him. Check back at www.timesgazette.com Tuesday and in Wednesday’s Times-Gazette print edition for more details.